The latest air traffic demand report, announced by aviation data provider OAG, shows that the next hot destinations for Chinese travelers are Vietnam and Cambodia. The report says that the overseas travel boom among Chinese travelers is extending from Thailand to Indo-China nations. Seat availability on the routes between China and Thailand expanded by 29% a year to 27 million seats in 2018 from 3.6 million seats in 2000, according to OAG. Seat availability on the routes between China and Vietnam has increased by 30% a year to 5.9 million seats in 2018 from 1.6 million seats five years ago. In 2018 only, airlines supplied additional 750,000 seats, out of which 57% was supplied by China-based airlines. For Vietnamese travelers, China is a popular overseas travel destination, next to South Korea. 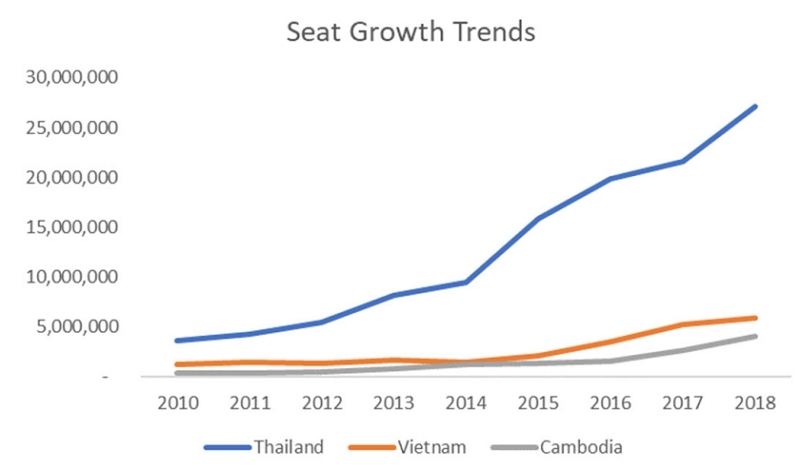 The same trend was found in Cambodia, as seat availability has increased by 40% a year to 4 million seats in 2018 from 750,000 seats five years ago (see the graph below). Meanwhile, airports in operation for domestic flights in China were 226 as of November 2018, five more airports than a year ago. 88% of international flights concentrated on 20 major airports. Seat availability was up 11.2% year on year to 878 million seats in total a year. The top three airports in growth of seat availability were Guangzhou, Shanghai Pudong and Shenzhen. Among 20 major international gateways, only Xiamen reduced international seat availability. Domestic seat availability was up 10.1%. While seat availability increased on 1,380 point-to-point routes, it reduced on 641 point-to-point routes. The top 15 growth routes were found on eastern China and coast routes, and reductions were found in western interior routes. The top route in growth of domestic seat availability was Shanghai-Shenzhen with additional 685,000 seats in 2018, followed by Guangzhou-Shanghai and Chongqing- Shenzhen. The largest reduction was found on Chengdu-Xian with reduction from 1.2 million seats to 245,000 seats, affected by open of high-speed railway between the two cities. 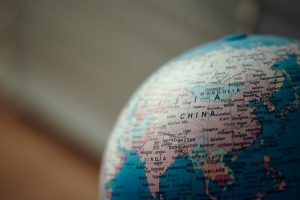 Chinese government has lifted off ‘One Route, One Airline’ policy on long-haul international routes of 5,000 km or longer, which is expected to boost business competition and expansion. The number of the 5,000km or longer international routes is 37 today, 18 from Beijing, 16 from Shanghai and three from Guangzhou to 15 cities in Europe and 13 cities in North America.